Fried pickles are really great for your taste buds, but the breading and frying they require make them not so great for your body. Instead of breadcrumbs, we coat the hydrating, fiber-filled cukes with almond flour and add antioxidant-rich spices like cayenne pepper; then we bake ’em. The result is a crunchy, salty, satisfying snack. In a medium sized mixing bowl, combine all dry ingredients. Remove pickles from pickle juice, using paper towel, pat dry and drop into dry mixture, tossing to fully coat. 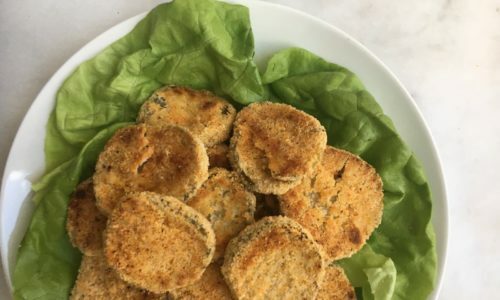 Place breaded pickle rounds on a lined baking sheet. Bake for 5 minutes, remove and flip each slice, and continue baking for 3-5 minutes. Keep an eye on them, cook time will vary! Remove when lightly browned, serve warm. Enjoy! Cucumbers are hydrating and filled with fiber and vitamins, and when they’re pickled, they’re crunchy, salty, and virtually calorie-free. Some pickles are also fermented, which means major gut health benefits. Coated in almond flour and baked like this, they totally satisfy our frickle craving.